Do I Want An Interactive Business Tool? The web allows for real-time interactions between a company’s site and its visitors but because the web is a venue that spans time zones a site may be visited at any time of the day 24/7. You want to provide for interaction between you and your customers at the time of their visit. Delayed interaction could cost you business. A static brochure site does not allow for real time information. In the fashion apparel business the only constant is change! New lines are always arriving. Styles, colors, sizes are dropped or added often. Sales and events are scheduled. Change! A data-driven site allows you to make changes instantly as they become necessary and without the intervention of a technically skilled (expensive) work force. 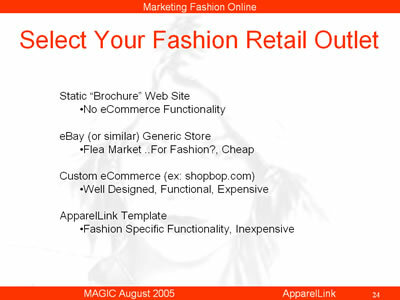 As an inexpensive alternative to the static site there are generic, data driven, online applications; for example, eBay stores. They provide excellent general eCommerce functionality in order to service any possible product. A custom built, data driven, interactive site would be the most expensive to build. A great example is shopbop.com. The company that engineered its functionality quotes a minimum of $15,000 to set it up and $3,000 per month to license its use. That does not include the web design or content creation. *These prices are for FBI members but the savings is so great that virtually everyone joins.